While the best way to experience Yellowstone National Park is by staying overnight inside of the park, there are many reasons to choose accommodations outside park boundaries. You might not be able to obtain an in-park reservation, or you may prefer a hotel that offers a greater range of amenities (you won't find air conditioning, TVs, or internet access at the hotels, cabins, and campgrounds inside the park). Perhaps Yellowstone is just one stop on your vacation itinerary. The small town of West Yellowstone, Montana, is located less than 1 mile from Yellowstone's western entrance along US Highway 20. It is very near the place where the borders of Montana, Idaho, and Wyoming come together. Book a hotel or motel in the city of West Yellowstone. Camp or rent a cabin at Henry's Lake State Park in Idaho. Camp or rent a cabin in the Ashton/Island Park area of Targhee National Forest. Camp in the Hebgen Lake District of Gallatin National Forest. 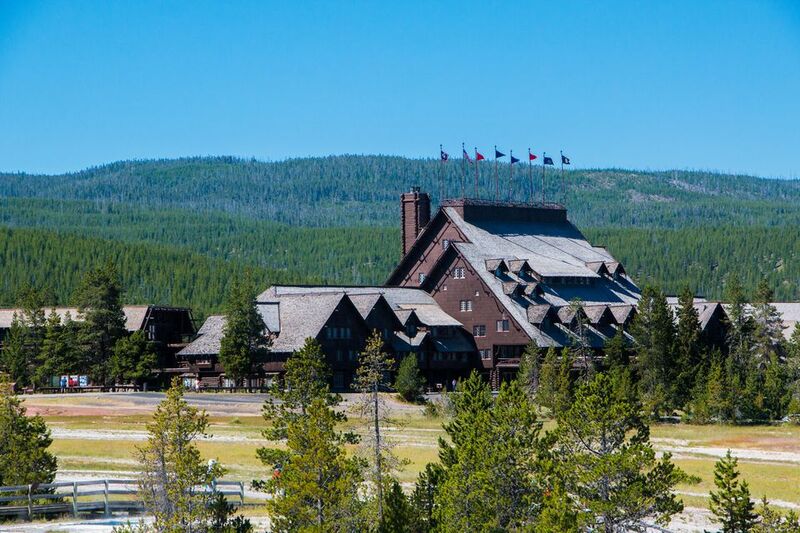 Check guest reviews and prices for West Yellowstone hotels on TripAdvisor. Gardiner, Montana, sits along US Highway 89, just outside the north entrance to the park. This entrance is closest to the Mammoth Hot Springs area of Yellowstone National Park. Book a hotel or motel in the city of Gardiner. Camp in the western section of the Gardiner District of Gallatin National Forest. Check guest reviews and prices for Gardiner MT hotels on TripAdvisor. The northeastern entrance provides great access to Yellowstone's amazing Lamar Valley. Cooke City, Montana, is located a few miles outside of this entrance on the Beartooth Highway (US Highway 212). Book a hotel or motel in Cooke City. Camp in the eastern section of the Gardiner District of Gallatin National Forest. If you approach Yellowstone National Park from Cody, Wyoming, to the east, you'll enter via US Highway 20. Stay in a cabin or guest house at Pahaska Teepee Resort, site of one of Buffalo Bill's historic lodges. Stay in a cabin at Crossed Sabres Ranch, located 8 miles from east entrance. Camp in the Wapiti Ranger District of Shoshone National Forest. A portion of NPS land called the John D. Rockefeller, Jr. Memorial Parkway connects the northern edge of Grand Teton National Park to the southern entrance to Yellowstone National Park. The Grant Village and West Thumb region of Yellowstone is closest to this entrance. Stay in a cabin or camp at the Flagg Ranch Resort, located within the Rockefeller Memorial Parkway lands. Camp in the Buffalo District/Teton Division of the Bridger-Teton National Forest.